Best wishes with the restoration of No. 5080. It should be an excellent engine for your service. Years ago, I had the pleasure of travelling many miles behind ex-CPR No. 1201. It was a perfect engine for both branch and main line trips. No. 5080 hearkens back to the Intercolonial Railway. It had an amazing service record, lasting to the end of steam. Is there a record of its final assignment? Let's hope its final assignment is yet to come. The CNR ran many Pacific Types in my area right to the end. They did everything from main line passenger service, to branch mixed and mail trains. One local operation required a back up move of about one mile on a truncated branch line with the morning, and then evening-return mail/passenger between Hamilton and Owen Sound, Ontario. My last train ride in regular service was behind a 5200 series Pacific on the CNR Dundas Sub. at speeds around 80 mph. That was in 1959. That is not entirely true because there were the 6060 regular service runs between Toronto and Niagara Falls in the 1970s - still at speeds exceeding 80 mph! April 9. Engine drive rod bushings, crosshead pin, etc.. had a 6 foot pry bar applied. Very little play was noted. Meaning main drive-line bushings have little wear. A good sign. However, the tender is beyond repair-to-service condition. Several suitable tenders are available. Is the plan to purchase a spare tender outright and then use the old one as a parts source, or trade the old one for a different tender from another park engine? Encouraging news about the bearings, and thanks again for all the updates! 1) The present tender will not be "repurposed". It will be removed intact, and delivered to a safe place. It's historical fabric is recognized. 2) As you would seem to know...Yes, there are conversations going on...for a usable replacement. Outside the Boss's office at Aspen Crossing. Yesterday, April 10, 2019. Lots of discussion going on. The appraisal process is well underway. The pilot was removed to fit on the lowbed hiway truck. Was very surprised to see the cab interior is remarkably well preserved. Bits and pieces missing for sure. But not trashed ...like every other Park Loco I've ever seen. Jeez...look at all those gauges, and operating handles... still in place after all these years. Looks like the locals really protected her. The headlamp is missing the front lense, and most of its internals. It may be cheaper to buy a complete one, rather than rebuild the original. Several people have suggested useful information, as where to buy one. The preference is rebuild ...but these parts are not cheap. But, as this is going to be the headlamp on an operating engine, decisions have to be made. Congratulations on a nice acquisition. Now a somewhat related question... I'm not familiar with the double firing valve. What does the handle on each quadrant control? Dennis - The top table is the oil regulating valve, the bottom one is the damper control. 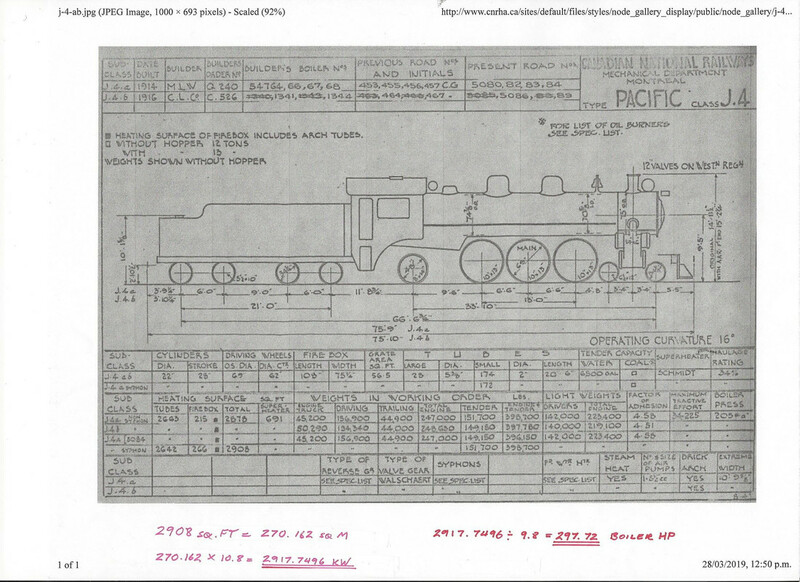 Some huge news today - Through the work of some friends at Exporail in Montreal (Mylene Belanger, Archivist and Jean-Paul Viaud, Curator), we have located the original blueprints for the boiler of #5080. This will be a tremendous help registering the boiler with the Alberta boiler branch, ABSA, and may also permit certain repairs to be made in accordance with the original code of construction. The alternative if the blueprints were un-available would have been to have the entire boiler reverse engineered and a new set of drawings made up. The boiler and pressure vessels/components will have to be inspected of course, but having the original blueprints saves an incredible amount of money, time and effort. Since Old Smokey mentioned that this engine was well protected in P.A, is her numberplate one of the "goodies" that has been removed and locked away somewhere for safekeeping? The numberplate was removed a few years ago and placed into storage. Jason has it in a safe place now! One of the class lights was given to a politician in Prince Albert, the other disappeared a long time ago. However, I have a set that I acquired for the cause along with several boiler gauges, cab fittings and gauges. It was a mess, but the City quickly followed my recommendations and promptly secured the cab, removed the numberplate, replaced the windows with plexi and padlocked the doors. I did my best to clean things up, put the seats back and secured whatever parts that I could. Shades of SP 4449 in Oaks Park, hopefully the story of CN 5080 has a similar happy ending. Thanks for all your hard work and the stories, we need more folks like you!